Georg Jensen tea egg, $65, through Studio Brillantine. Glass, stylist’s own. On an early December evening in Vancouver, hundreds donned sparkles and suits to walk a red carpet downtown despite the unusually snowy weather. Supermodel Coco Rocha was a guest of honour and posed with party patrons, as well as with the event's hosts, Taha Bouqdib and Maranda Barnes. The couple had invited the crowd to celebrate the opening of their new store, TWG Tea, which includes a boutique, tea salon and restaurant. As attendees sipped on tea-infused mixed drinks such as the Prestige Cocktail (TWG Tea Pink Flamingo tea syrup with La Marca prosecco), they likely clued in to the fact that TWG isn't your standard tea shop. Of the 500 varieties available in store – the Singaporean brand's first foray into North America – prices range from $17 for 100 grams of Napoleon Tea, a black tea blend, to $2,723 for 100 grams for Imperial Gyokruo, a Japanese green tea, only three kilograms of which are available worldwide. The thought of someone paying almost $3,000 for tea, however rare, might seem decadent even though tea, like fine wine or spirits, exists at all price points that depend on similar factors, from terroir to Mother Nature's whims. But while seasoned steepers in prime tea-growing and consuming countries such as China, Japan and India are more educated on the diversity of the beverage, North Americans are just learning about the luxe possibilities for filling their china cups. By opening TWG in Vancouver, Bouqdib and Barnes hope to be leaders in this education process. "We're trying to be a reference, so that you'll know where you can ask questions and find information," Barnes says. To the average consumer, they may seem ahead of their time, but many in the industry think tea's moment is now. Tea is the second most consumed drink in the world, behind only water according to market research firm Euromonitor International. Canada – where the average tea drinker has 11 different varieties in their kitchen cupboards – has a particularly progressive tea-drinking population, which Euromonitor attributes to immigration from countries with strong tea-drinking cultures (China, India, the Middle East and Russia), an interest in being health conscious, and a penchant for learning about different varieties. Sales of tea reached $1.3-billion in Canada in 2015 – a 23 per cent increase over the year before. "In Canada, it's all about specialty tea," says Louise Roberge, president of the Tea and Herbal Association of Canada. "The image of tea is changing so you won't be afraid to show yourself with a cup of tea and think that you're old. Millennials are drinking tea, and they love the culture." By 2020, Euromonitor forecasts that the tea industry will see $20-billion (U.S.) in growth, and calls it the most dynamic category in global beverages, adding that it is now in "an era of value creation," with ultra-premium and luxury tea claiming a share of the increase. All facets of the industry are reacting to the rise in consumption of specialty tea. Last February, Mohammed Bin Yahya and Tariq Al Barwani opened Plentea Tea Bar in Toronto's Parkdale neighbourhood. The industrial-looking café specializes in tea-based hot and cold takeaway beverages, and is a laboratory of sorts for customers who want to learn about blending. "Coffee is popular here because of the varieties. If you go to Starbucks you're going to see things you can mix with lattes," says Bin Yahya. "We decided to take it to that level, where we can make tea with the same varieties as coffee. I think that brings more attention to people and they're interested in trying it and making it part of their lives." Bain de Roses is a fragrant mix of Darjeeling, roses and vanilla, $29 for 15 2.5-gram tea bags, at TWG Tea (www.twgtea.com). Tom Dixon Form teapot, $365, Hering Berlin Alif Gold cup and saucer, $230, Dibbern Golden Forest tea cup, $103 (part of a set) at Hopson Grace (www.hopsongrace.com). Carnets d’Equateur cup, $805 (part of a set), Voyage en Ikat saucer, $510, Voyage en Ikat small bowl, $310, at Hermès (www.hermes.com). Tom Dixon Form small bowl, $135 for set of five, at Klaus (www.klausn.com). There was a time when TWG wasn't sure there would be an audience for luxe tea. The company opened in 2008 in Singapore's financial district. "We opened about a month before the financial crisis," says Barnes. "It was a shock. The irony of it was that everyone needed a cup of tea. Businessmen were having meetings there, all the bank CEOS in the general district were coming in, and it was a time when people didn't know what was going to happen. And we thought if we can survive in this time of uncertainty then there's no stopping us because [tea] is an affordable luxury, rather than going out to buy a luxury handbag or car. It was an eye opener for us." The following year, the company opened four locations including two more spots in Singapore plus outlets in Tokyo and at Harrods in London. It now operates 57 locations in 17 cities. From day one – lining up alongside the businessmen – millennials have shown keen interest. "Asia has a very large population of people under 25 who have some means and want to experience new things," says Barnes. "They travel immensely. They are aware of cool pastry shops, tea shops, coffee, shoes. They recognized the cool, chic factor without the huge price tag." Vancouver's location stocks the company's Instagram-friendly Haute Couture collection of loose-leaf tea packed in colourful boxes that boast original artwork. For entry-level shoppers, the same blends can be bought in tea-bag form in a nondescript box at a lower price point (the loose, Haute Couture version of a green-tea blend called Silver Moon costs $47 versus $29 for the same blend in tea bags). The company's shop floor staff, dubbed "tea connoisseurs," spends an average of 20 minutes with each customer, teaching them not only about the differences between teas, but how they should be prepared and what foods they can be paired with. Tea can be blended or used as an ingredient in alcoholic cocktails (Forbes identified tea-infused cocktails as one of the 2017's top food and drink trends). And it has its own impressive array of mixing and serving accoutrement. Like wine, tea is best enjoyed when served in specific glassware. 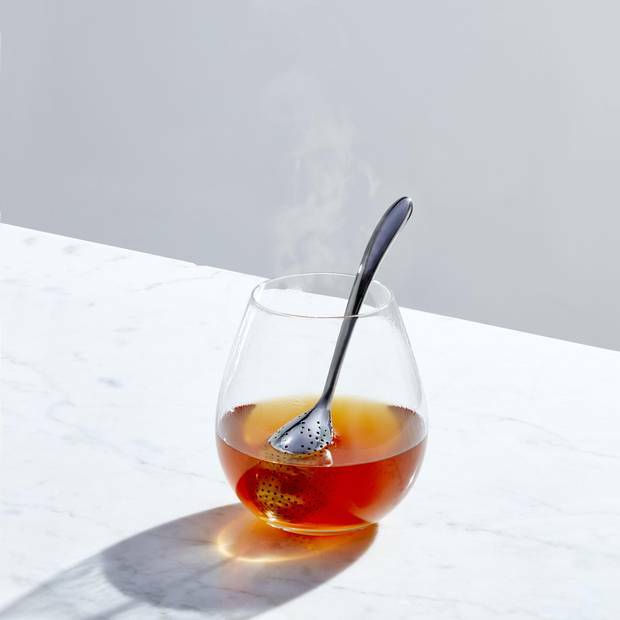 In 2013, for instance, a handful of hotels and restaurants in London began serving premium loose-leaf teas in stemless Riedel glasses (the same model recommended for pinot noir). 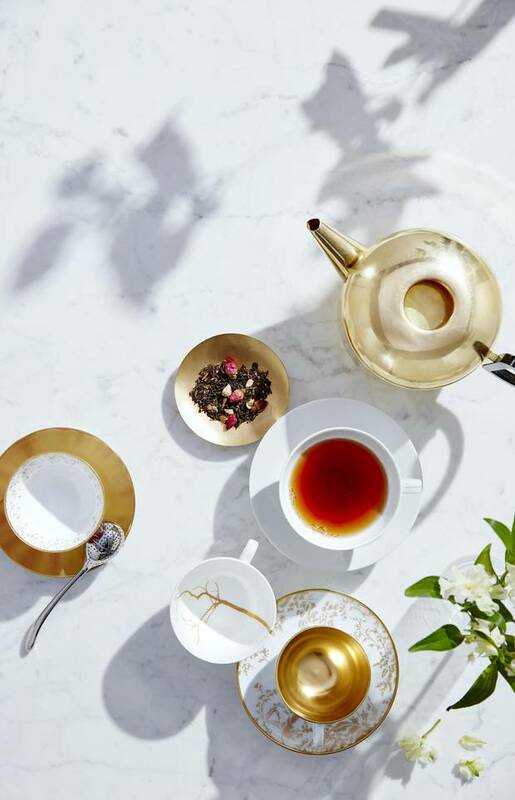 Joining Riedel in offering fine tea accessories are brands like Tom Dixon, which sells a spun brass tea pot for $365, and Hermès, whose Carnet d'Equateur cup and saucer cost $805. In August, Kitchen­Aid debuted a glass tea kettle that costs $199.99 and comes with five specialty settings so that water is boiled to the temperature that best enhances a specific type of tea's flavour profile, whether white, oolong or herbal. Bouqdib says the biggest trend in tea this year will be "refinement." Customers who might have their interest piqued at a place such as Plentea or treated themselves to a fancy new kettle will find their way to a shop like TWG to dig deeper and learn more. Or more refined tea options will come to them where they usually grocery shop. On Feb. 18, Loblaw is launching three specialty loose-leaf teas under its PC Black Label brand: rooibos with chai spices, Chinese green tea with ginger and pineapple, and a black tea blend of Darjeeling and English breakfast with blueberries. What the tea industry hasn't developed yet is its version of a wine tour. You can't visit a tea plantation like you might a vineyard or distillery, sampling product and meeting the faces behind the brands, learning about varietals and perhaps splurging on a premium tin. "The estates in the tea industry are very private and they don't sell directly to customers," Barnes says. "You can't get in a car and drive around to tea plantations in China; they won't let you in." Until they do, TWG hopes to act as the industry's cellar door.